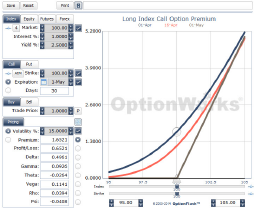 Add OptionWorks® to Your Trading Tool Belt! Smart options trading requires more than just identifying a market trend and a strike price. Savvy traders recognize that the key to sound options trading is pinpointing several vital variables. 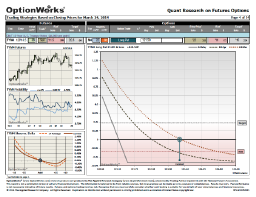 Use OptionWorks® Research to analyze critical metrics to help improve your options trading! Gain unique insight into futures options available nowhere else. 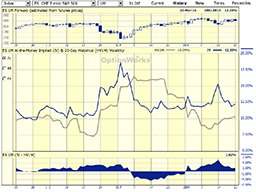 Enjoy access to a database of option information and daily strategies. Get help with risk/reward visualization, trade management and more! For the past twenty years, John Nelson has provided quant research to big banks, proprietary trading firms and hedge funds. Every day the OptionWorks® Database processes more than a million futures and option prices to produce its proprietary models for trend, volatility and skew. The OptionWorks® Trade Engine then analyzes those results for ten major option contracts and identifies the optimal strategies to consider based on current market conditions. Now dt clients have a significant new device to consider adding to their trading tool belts. And the best part is that OptionWorks® is discounted for dt clients! For a limited time through Daniels Trading, a subscription to OptionWorks® Research is available at a $20 monthly discount. Receive the Daily Strategy Report and monitor the Volatility Dashboard to access an extensive database of quant research on futures options. The OptionWorks® Daily Strategy Report delivers detailed trading ideas for ten major US futures markets. Indicators for trend, volatility and skew are calculated from the OptionWorks® Volatility Database and are used to develop strategies that best take advantage of current market conditions. Risk and Target levels for each strategy are also included to assist in trade management. The OptionWorks® Volatility Dashboard provides an online window into the OptionWorks® Volatility Database. Current implied volatility levels, risk reversals, and butterflies are available for 40+ markets worldwide for all expirations and selected OTC tenors. Available charts include underlying price, historical and implied volatility, skew, percentiles, and term structure. Sidestep the pitfalls of struggling futures options traders and put institutional-grade analysis in your corner!